Hey! Here’s an update on where we are at with the animations. As of right now the only thing we have fully modeled is Kaia herself. It took a little bit of hard work but I think I now have a good understanding of how I want Kaia herself to move. I’ll be going over the research I did to bring this character to life. 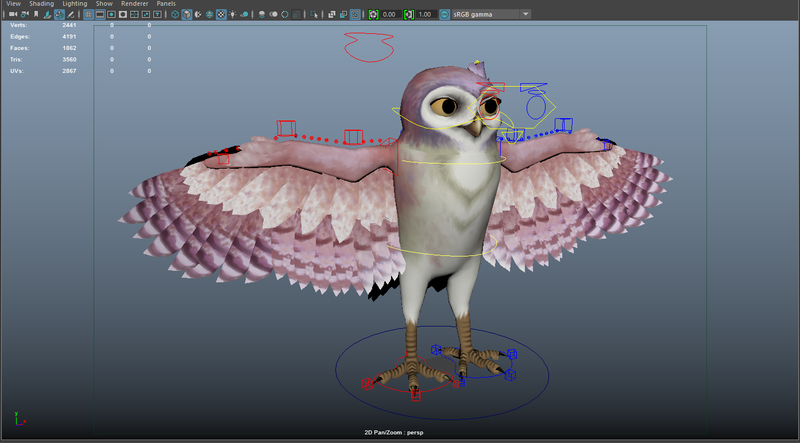 To start I had to give Kaia her bones and controls so that I could move her anatomy just like an ordinary owl. This process is called “rigging” and it takes a lot of time to get it right. To keep it simple I’ll give you some pictures of the progress. Here she is looking so pretty. Now let’s take a look underneath the skin. Ewww Gross! I know right but this is necessary to make the character move. I know it’s hard to see but each one of those small points is a bone, 98 to be exact. Each one influences a piece of the Kaia’s body. Once this was done we need to add controls to the bones cause no one in their right mind would want to move 98 separate bones. That’s just crazy. There we go. So we took away the bones and now you can see only 28 controls. Each one does something different. 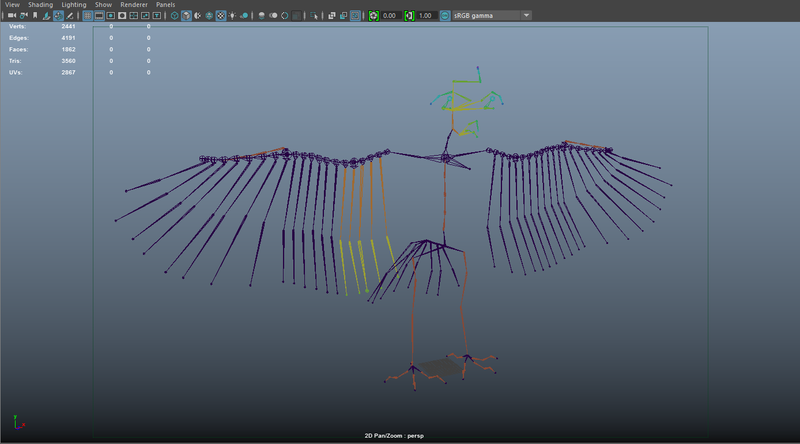 I put a lot of control for the feathers because the animators like it when the controls are well designed and best suited for the type of animating you are doing. 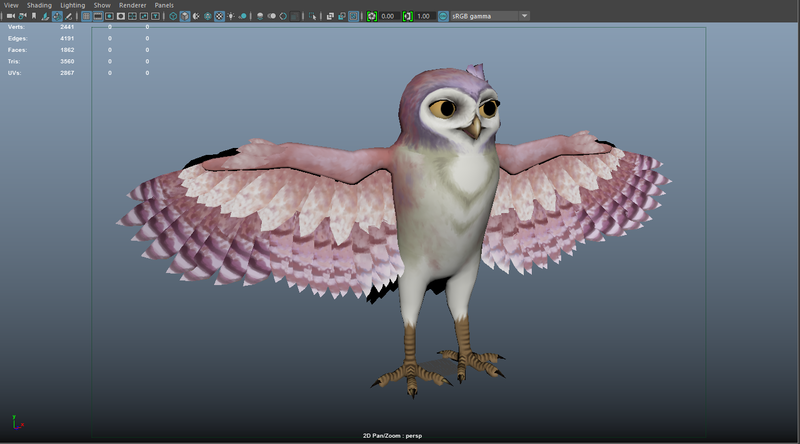 Now to animate this thing I first had to become the owl. So for a whole day I spent acting out how I would think an curious owl would. Owls can’t move their eyes so if I wanted to look at something I had to move my entire head. And if I wanted to move somewhere I would crouch down in a little ball and act it out. If you think I would be crazy enough to do this in front of everyone you’re right! We animators are pretty crazy but we have to get in character so that the animations reflect how we want them to feel. During this time I also looked for inspiration on the internet from owls running in slow motion to watching the movie “Owls of Ga’hoole” like 13 times. Great movie by the way. So when you are making a game character you have a list of all the different animations you need to complete for each type of input you want your character to have. I started with the most important ones so that the game would be playable as of right now. That consisted of running, idle, jump, double jump, and glide. There are many more that I have yet to do but I wanted to share with you what I have done so far. I hope that you are looking forward to the game cause I can’t wait either. Right now I’m trying to figure out how an owl would swim underwater! I’ll update you on that once I get it done. Thanks for checking in and stay tuned for more!